Last week, in the company of Dilan Wijeyesekera and Vidusha Wakista, I tasted teas from the regions of Dimbula, Uva and Nuwara Eliya, side by side. 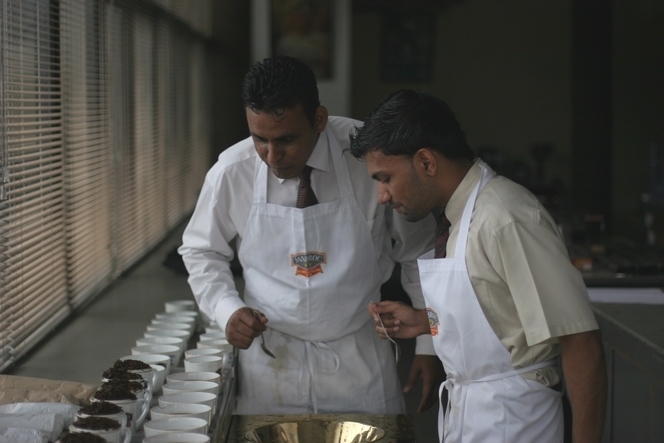 Dilan and Vidusha work for the company Mabroc and supply some of our teas from Sri Lanka, which come either from their own plantations or the Colombo auctions. We also discussed “low growns”, teas from the south of the country that grow at a low altitude, and which have steadily improved in quality over the years. Most low tea plantations don’t use the rotorvane, a machine widely used on high grown plantations, which handles the leaves more roughly than the orthodox procedure.